In the music scene these days, bands seem to come and go before they even have a chance to really get started. Your new favorite band releases one EP and the next minute they’re breaking up. 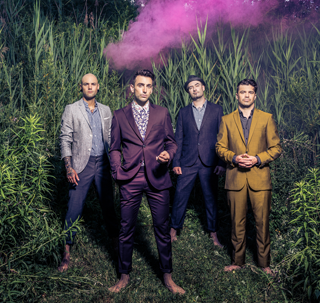 Longevity in this business takes hard work, and Hedley, about to release their fifth album, have what it takes to achieve it. Since the band has been together for so long, having just passed their nine-year anniversary, evolving and changing with their older fans is important, but they still want to attract newcomers. “Not everyone nine years later is going to want to hear about a dude singing about just being a kid and ‘screw your parents’ and everything else. We’ve just been fortunate enough to just naturally grow with our audience,” Tom says. “The album is all over the place,” he continues. “The album goes from asking ‘What the hell is wrong with this world?’ to ‘We’re all in this together,’ to ‘Hey, if you go out with us tonight you’re probably gonna end up in jail with us!" Tom and drummer Chris Crippin come from metal backgrounds, while vocalist Jacob Hoggard is a reggae fan and guitarist Dave Rosin is an “AP guy for sure.” Tom believes the different influences and backgrounds are what come together to make the Hedley sound. Wild Life will be released on May 20th via Capitol. Pre-order your copy today via iTunes. You can read our review of the band's new album here.